Lock in a great price for Villa Scacciapensieri – rated 8.6 by recent guests! Exquisite property and extraordinary service! 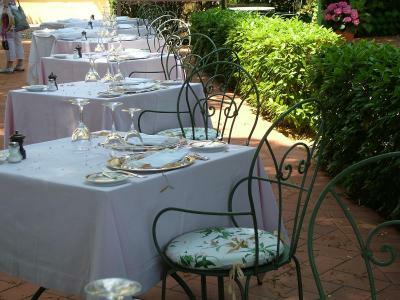 Beautifully decorated home and rooms, conveniently located in a quite area close to Siena. Super friendly and helpful staff. Uniformed porters help with luggage. Beautiful restaurant on-site. Amazing breakfast. An absolute gem of a place! Everything was lovely. ; the property was magnificent. The staff were very kind, friendly and helpful. The breakfast was delicious. We will stay there again if we are in the area. This Villa is a gem to find when traveling. It is located outside the city center. A local bus passes by the property frequently. Very easy to get into town without having to worry about parking near the city center We stayed in a two room suite, well appointed and spectacular views. Breakfast each morning was superb !!! The bar was open 24 hours and you could order sandwiches or drinks. Would definitely stay here again !!!! Staff was wonderful and our room and view fantastic. It was a perfect spot to spend our honeymoon. Using the bus to go into town was easy. Breakfast was great and varied. The property was filled with antique furnishings and art. Excellent staff, friendly and knowledgeable. The site, the building, the premises, breakfast and the staff. Breakfast was great. The staff was exceptional! Breakfast service was nice - fresh coffee, and freshly made eggs. Location was great; close to city center but far enough away. Easy access to get anywhere we needed to go. Onsite, free parking was nice to have. The peaceful surroundings and the helpful and friendly staff. Beautiful luxurious villa with gorgeous surroundings and pool. Staff extremely polite and courteous, very efficient check in and check out. Large rooms with large bathroom. We did not get a chance to eat dinner at the property but the menu looked wonderful. City of Siena - beautiful and interesting...full of history - private guide a must! Bus to the city center - not something I will repeat. Crowded and hot, about 20 minute ride. The trip back to the villa at 11 pm was a joke. The bus did not come for an hour and we ended up taking a taxi after all. Villa staff is nice enough to buy the tickets back from You if unused. Highly recommended! Villa Scacciapensieri This rating is a reflection of how the property compares to the industry standard when it comes to price, facilities and services available. It's based on a self-evaluation by the property. Use this rating to help choose your stay! One of our top picks in Siena.Villa Scacciapensieri is surrounded by a large park just outside Siena, and offers beautiful views of the Chianti Hills. This 4-star hotel offers a range of rooms, a swimming pool, a tennis court and excellent cuisine. Villa Scacciapensieri's main building was built in the late 18th century and has rooms on the 2 upper floors. Other rooms are located in 2 annex buildings. On the ground level of the main villa you will find the 24-hour reception desk, a bar with lounge, a library, a private chapel, and a media room with internet access. 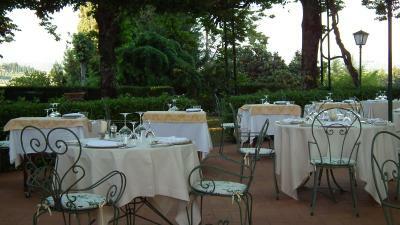 The Altri Tempos Restaurant serves characteristic Tuscan cuisine, including homemade pasta. 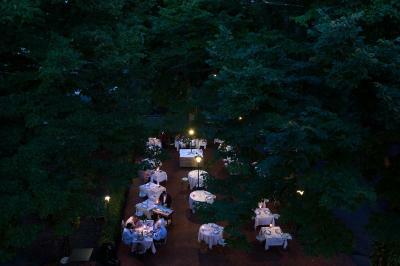 During the summer guests can dine on the terrace. 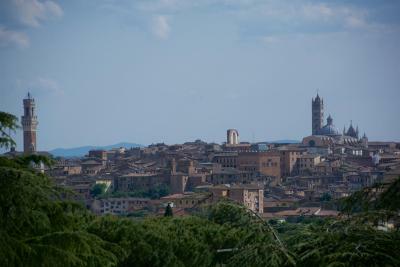 The center of Siena is just 2.5 mi away. Public busses to the city center stop in front of the Scacciapensieri, and run every 15 minutes during weekdays. 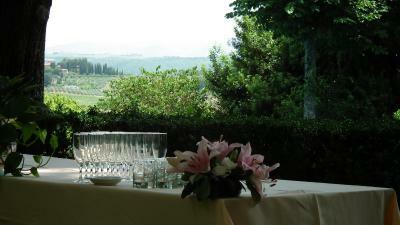 When would you like to stay at Villa Scacciapensieri? With air conditioning and an LCD TV. The annex is only 16 ft from the main building. On 2 levels: with living room downstairs and bedroom upstairs. With air conditioning and an LCD TV. The annex is only 15 feet from the main building. This suite has a mini-bar, satellite TV and seating area. Air-conditioned room with an LCD TV and a raised sleeping area. 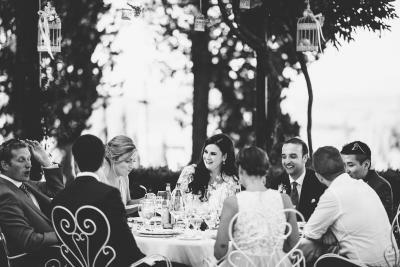 House Rules Villa Scacciapensieri takes special requests – add in the next step! Villa Scacciapensieri accepts these cards and reserves the right to temporarily hold an amount prior to arrival. The double rooms in the annex may not be suitable for guests who have difficulties with steps and for small children, because there is an internal staircase in these rooms. One of the most picturesque neighborhoods in Siena! The at check-in was extremely helpful giving directions and travel advice. Breakfast was wonderful. It was unfortunate that the restaurant was not open yet. Snob staff meets us with pretensions on they own rules. There is only one rule - hotel serves for guests, not inverse! The impression was broken for whole stay. The furniture and bath equipment were old (not historical at all, simply old and wait renovation for a long time). Old building with luxury high pointed ceiling in the room. Lovely keeping green park territory. Just one thing. There’s no hot dishes at all at breakfast. Everything was fine. A nice villa not far from city center, with a beautiful view. That we didn’t stay longer. The wood fire, the chapel, the very friendly staff, the surroundings, the buildings, the amazing fresh beautiful breakfast and variety. My wife was sick and they asked how she was. Beautiful place all round. Highly recommend. The location was absolutely beautiful and on the bus route, but a complex drive to the parking areas of town. Take the bus!